upper rad...as long as the res is higher, the air will work towards the res. Cheers for the info. Gave it a lot of moving around, adjusting the pump speed and shifting the pump angles which finally dealt with the remainder of the air. 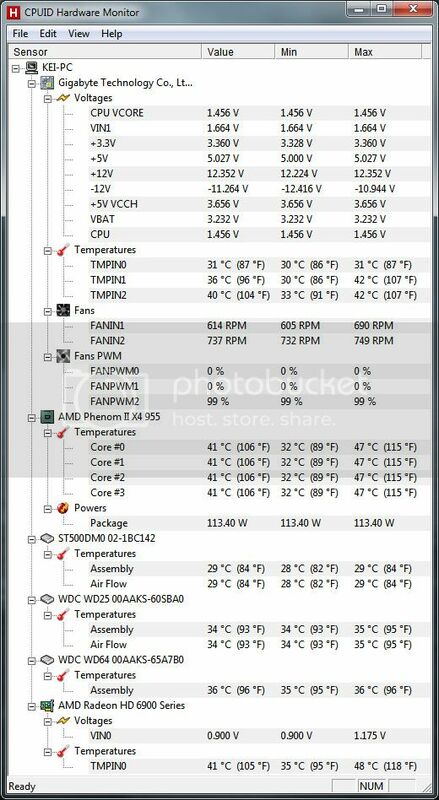 Idle temperatures with two of the case fans off and the one rad fan off and the rest running silently is 37 degrees for the cpu and 41 for the gpu. Not run anything yet but I reckon load temps will be greatly improved. 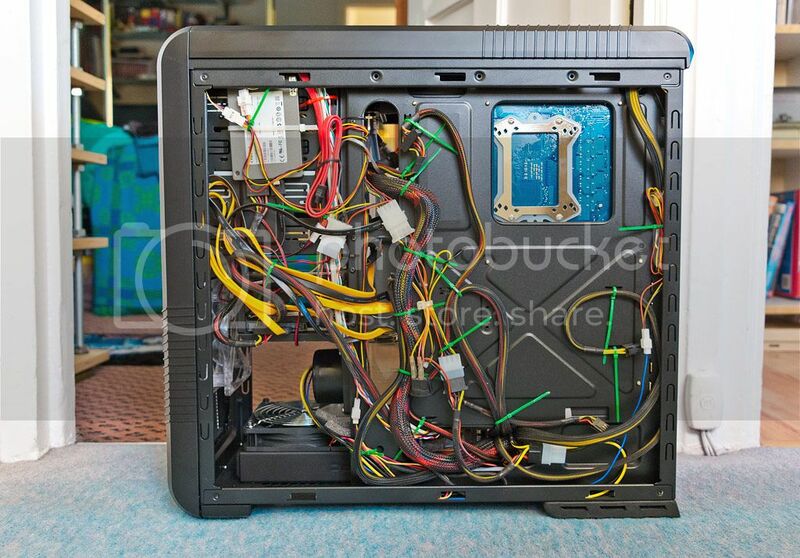 The hidden mess of cables isn't quite as bad as it was before. Lots of green cable ties. (not sure why i chose green but just went with it. Not that you can see any of them) Coolermaster grommets for the holes will be ordered next month. 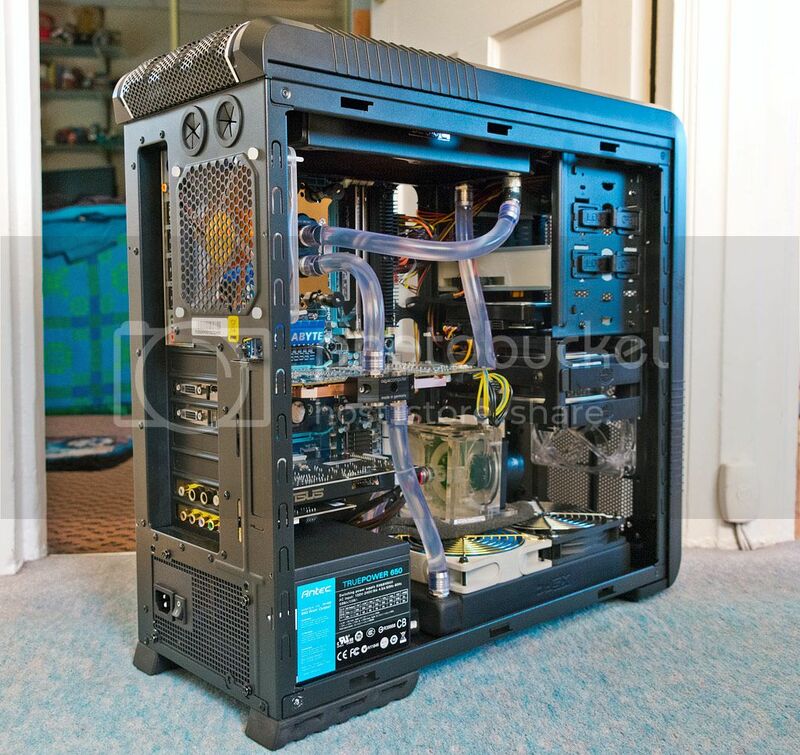 The aquacomputer aquagratix block is very smart, just wish they did a backplate for the 6970 like the one they have for the 7970. 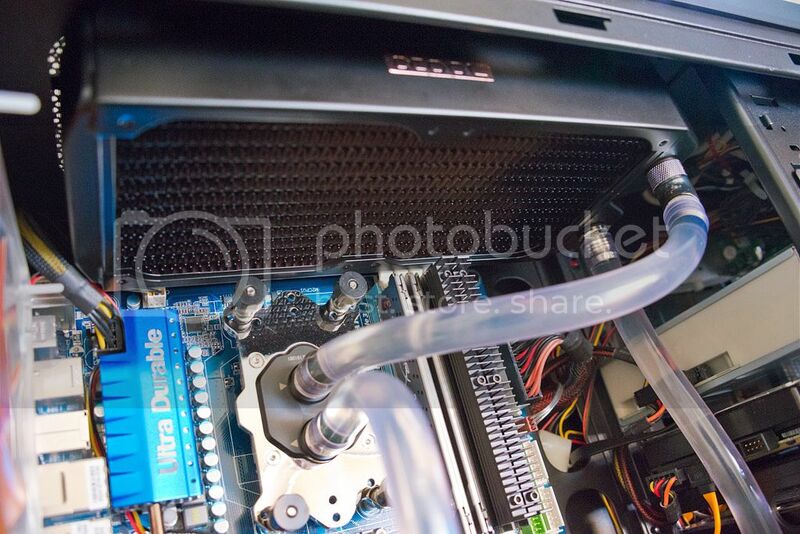 The alphacool XT45 is a very tight fit up top. With some severe difficulty, i can just about manage to remove the memory without needing to shift the radiator. 3. 2x 140mm case fans. Should be BeQuiet silentwings USC's to match the side panel but they are insanely expensive. Probably end up with 3x of something else that cost less but match. 4. Braid the unbraided cables. Might consider bitfenix alchemy extensions for some of it. 5. Get a 2TB+ hard disk and migrate current drives/partitions across. Also considering getting an icybox backplane so i can fit more drives into the 5.25" bay. 7. May well consider changing the XSPC EX for a thicker unit like an alphacool UT60 or a monsta. 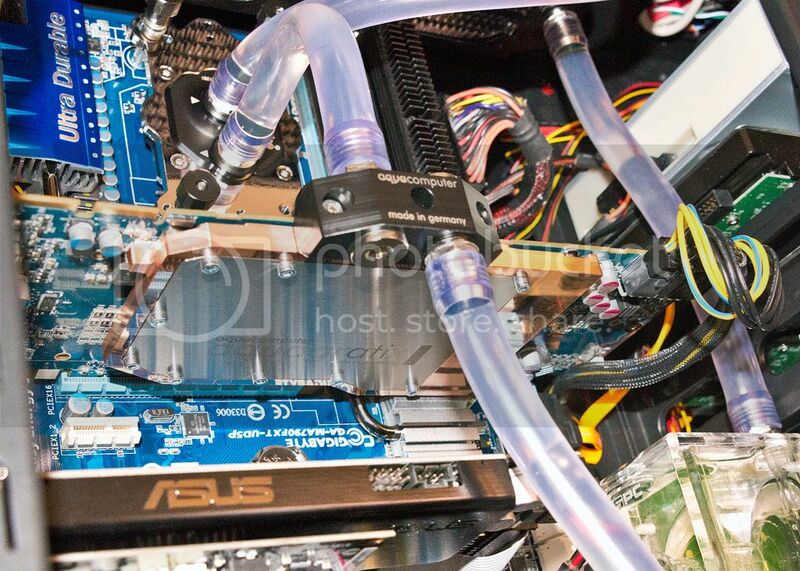 I like the look of all the parts used (tubing, res, blocks etc) and I like the blue. 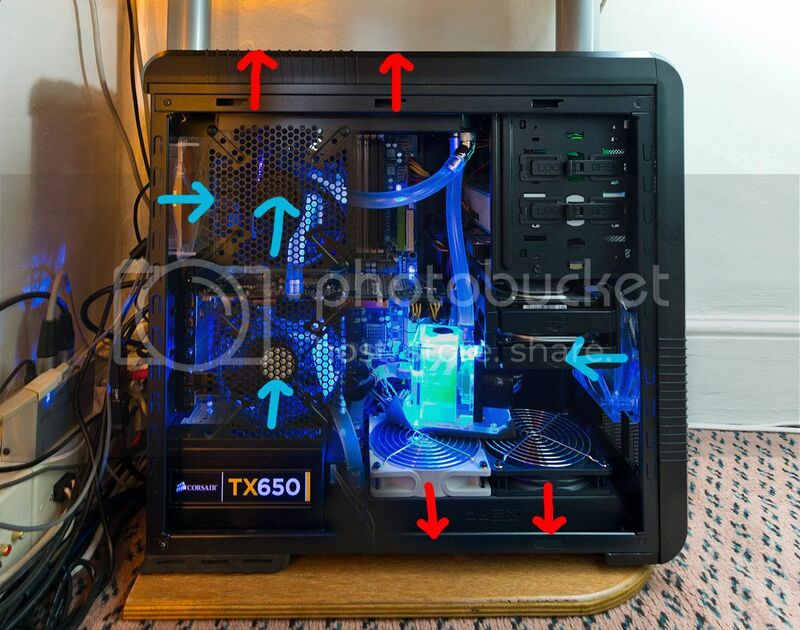 The blue fins on that deep cool fan are nice. Good looking system. Changed the TIM from arctic silver 5 to prolimatech PK1 and got a fair change in temperatures. just for giggles, for better cool flow, reverse the floor fans from push to pull. together), all side-panel as intake. 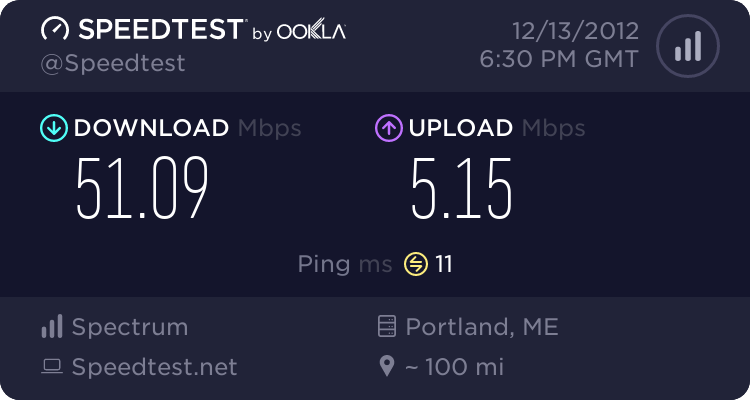 Great looking for your first att. btw. Yeah the only leaks I've ever had in 10 years were related to cracked tubing. The PUR stuff that used to be popular in German speaking circles for push fittings was stiff to begin with and would become brittle over time. Once cost me 4 brand new HDDs (shorted out a SATA controller circuit on my M/B ). Luckily, I could RMA 3 of them (4th had private data on it, couldn't risk that). But the O-Rings on my fittings have always done their job. Will give this a go once i sort out which fans to go with for the case. I'm going to sort another pair of scythe AP-15's for the bottom radiator. The case fans will be 140mm for the front and side panel. I intend to have a matching set of 140mm fans all round, but not sure on what to choose as scythe still don't make a 140mm GT and slipstream/kaze fans are sleeve bearing.